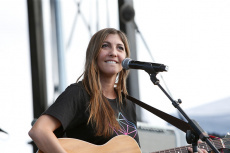 Aja Volkman is an American musician and the front woman of the American alternative rock band Nico Vega. After a solo performance in 2005 in Los Angeles, California, guitarist Rich Koehler and drummer Mike Peña (who was later replaced by Dan Epand when Peña pursued his acting career) approached Aja about creating a band. The band was formed in 2005 in Los Angeles, California, and is comprised of lead vocalist Aja Volkman, lead guitarist Rich Koehler, and drummer Dan Epand. The group has released two albums Nico Vega (2009) and Lead To Light (2014). Billboard described Lead To Light as possessing "some of the most unstoppable pop-rock hooks heard all year." After a hiatus announced on 6 June 2016, the band returned on 5 April 2018 when Volkman announced a new single and a return on her Instagram. Nico Vega, has toured and performed with Imagine Dragons, Neon Trees, No Doubt, Blondie, and Gavin Rossdale. Volkman is a member of The Church of Jesus Christ of Latter-day Saints. She is married to Imagine Dragons front man Dan Reynolds. They met when Imagine Dragons opened for Nico Vega in 2010 in Las Vegas at Wasted Space. Although Imagine Dragons started out opening for Nico Vega, Aja, and her band ended up opening for Imagine Dragons. Reynolds invited her to work on some demos with him. In 2011 they recorded and released an EP they titled Egyptian. Dan and Aja were married in March 2011, and their first daughter, Arrow Eve Reynolds, was born in 2012 and their twin daughters, Gia James and Coco Rae, were born in 2017. In May 2018, the couple announced their intention to divorce. However, in January 2019, Volkman announced that she and Reynolds are "rebuilding." In September, Reynolds had told People magazine that watching the effect of their split on their daughters has been very hard for him. They currently make their home in Las Vegas, Nevada. Volkman made her acting debut in the film Answers to Nothing. "Fade," a song off the Egyptian EP, was featured in the movie soundtrack. In 2015, Aja began working on a solo project. Since January 2016, she has released three singles, which are available on YouTube and iTunes.